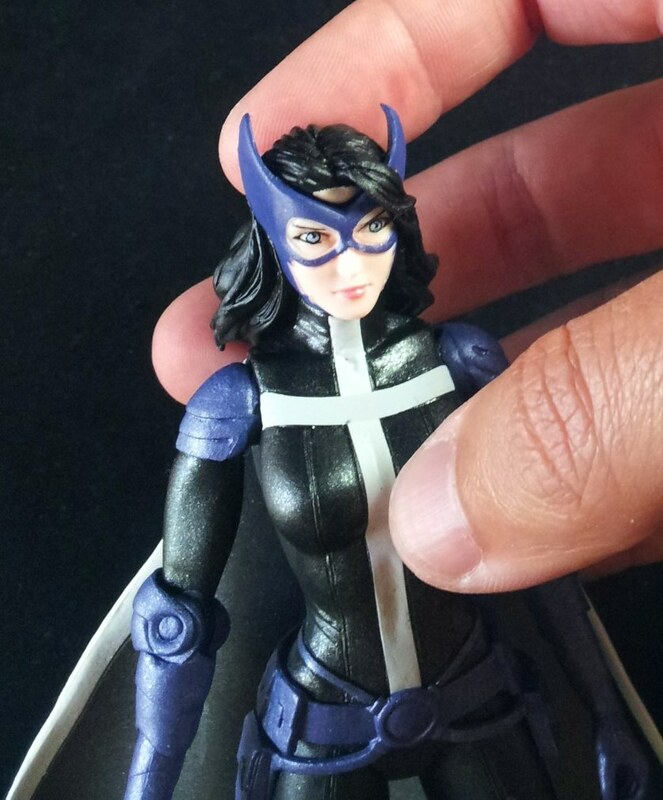 She's Fantastic: DC Comics World's Finest HUNTRESS! 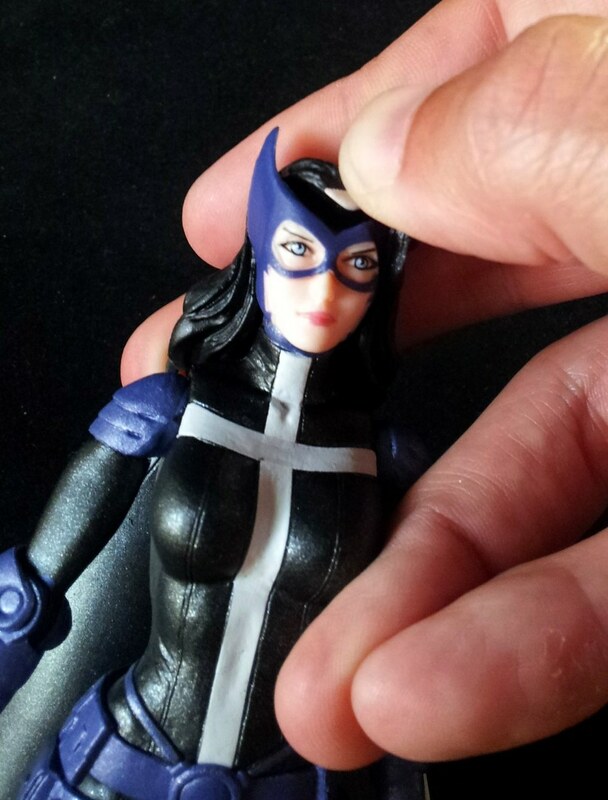 DC Comics World's Finest HUNTRESS! Huntress is one of the most underrated heroines in the Bat-universe. She's been a constant presence since her introduction in the late 1970s, but she always seems to be on the back burners in comparison to the other ladies. I was really excited when this two pack was announced. 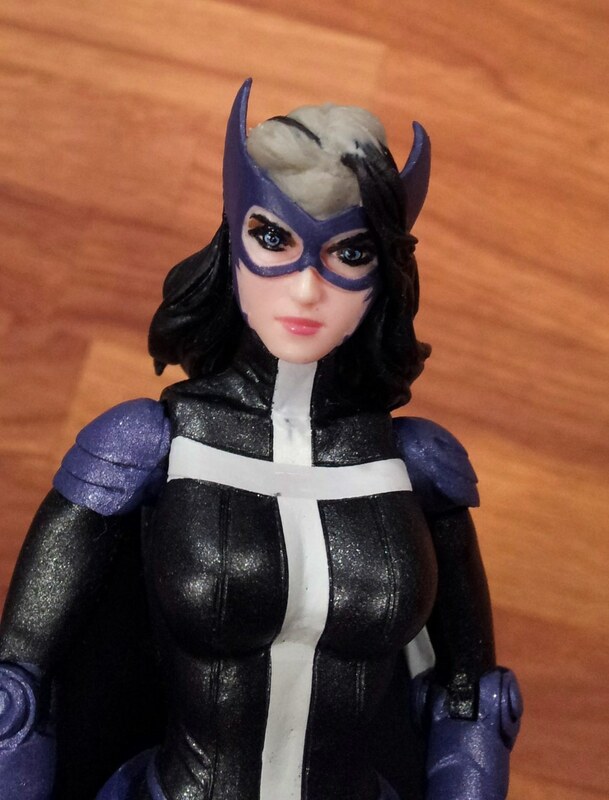 Not only was it great to get a new Huntress figure, but having her packaged with her longtime friend Power Girl was a total bonus. Upon getting her, however, I was struck by the differences between the solicit images and the final product I was holding in my hands. In my mind, there are some major production issues with this figure. You can tell the engineers who prepped her for mass production made a few errors and, in my opinion, greatly changed the look of the figure. I never let my disappointments get me down though, and I quickly put her under the knife and tried my best to restore her to her paint-master glory. I have lots of before-and-after shots below. But for now, let's check out the lovely Helena in her original form! Okay. Now, I realize some may view me as overcritical, but I think her head is totally misshapen. It's actually too small on top to encase a fully sized brain. It doesn't look so bad in these pics, but in person it looks creepy. The sad part is that the original sculpt by Jack Mathews looked beautiful (and cranially correct). After the group pics at the bottom of this review, I'll highlight just how this head was shrunken and what I did to fix it. Huntress comes with her signature crossbow. This is my favorite huntress crossbow in my collection because it is an appropriate size for dynamic poses (this is about the size of a large pistol, while most Huntress crossbows are more like rifles. Here she is with her fellow 2-packer, Power Girl (to be reviewed in the next few days). And here she is with the DC Direct Hush Huntress and the Mattel DC Signature Collection Huntress. Okay, now to the griping and customizing part. Here what happened: The fabricators decided to make the casting seam along the top edge of her mask. This would be a great plan if executed properly. The tiny triangle of forehead is actually the same piece of black rubber that comprises her hair. On my figure this piece wasn't attached at all and could be easily lifted up to see the hollow cavity within the head. The problem is that the forehead piece got trimmed way too small. This makes the entire rubber hair piece ride low on her head and gives her an odd dopey look. Also, the eyes don't have the same shading as the prototypes shown on the packaging. I think most people imagine Huntress with much darker Mediterranean features. This was my first attempt at darkening the eyes. And here is how I sculpted her a new forehead. I used Apoxie-sculpt 2-part epoxy clay. It air dries to a really solid plasticy-feeling finish. So here is my final product with her new eyes and forehead. Do you think it would be possible for her head to fit on the Mattel body? One of these days I'd like to customize that Mattel figure and give her a new head while I'm at it. Honestly I was unable to remove the head at all. I couldn't figure out the peg system and I pulled so hard I thought I would break it. Scale-wise though it's a close match. 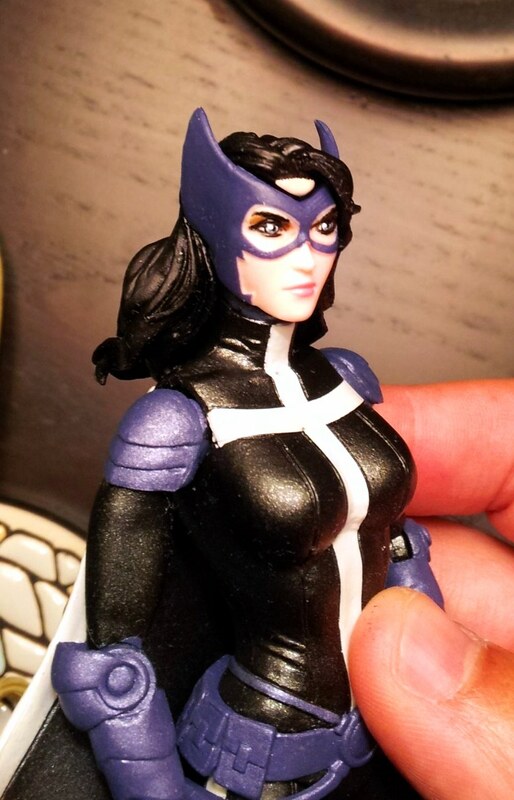 This looks like the best Huntress figure we've ever gotten, can't wait to get my hands on it! Excellent work with the mods, really precise work on her eyes! She's a great figure. You'll be happy, but I'm warning you you won't like her head so much in person. I look at my pictures and think I was overreacting, but then I see her unaltered in the stores and I cringe at her head shape and eyes. Finally got this set, and while I agree her face frame is a bit to round, I did not find it flat headed. In fact I was very pleasantly surprise. My favorite Huntress will always be the Earth 2 one, but this one is very cool. I did like the Hush but she was impossible to stand. And I never got the Universe Classics as I loath the head and hair. I think the key to standing the Hush Huntress is to have her bo staff counterbalancing her. Mine stands pretty well on her own with that accessory distributing her weight. 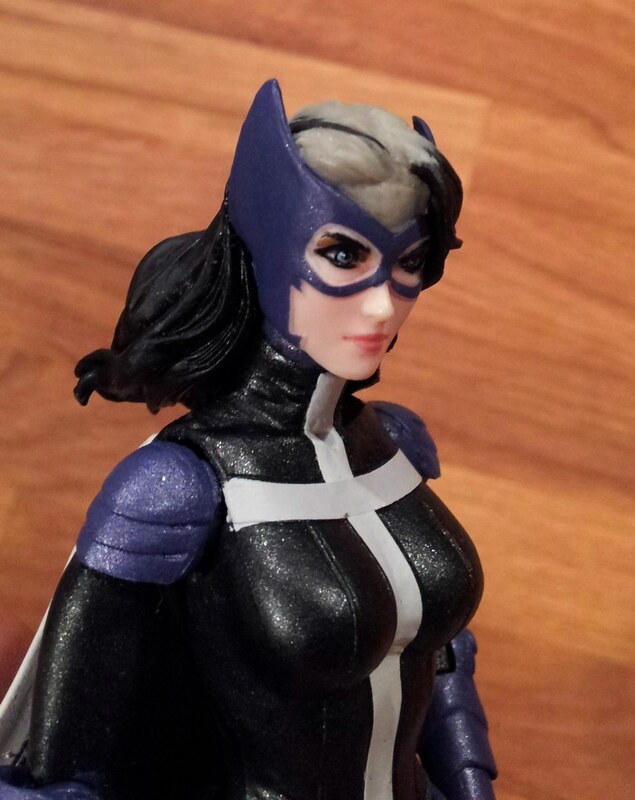 I wonder is the QC on this new Huntress got better as the production continued. I think that's the one fault in my rush to get things so early.. I never allow time for QC corrections to be made. I bought the first wave of Funko GOT figures with the breaking limbs. But on the flipside, I've recently passed on a bunch of the Funko reAction figures because the eyes were stamped on wrong. I figure corrected versions will be on the shelves eventually.